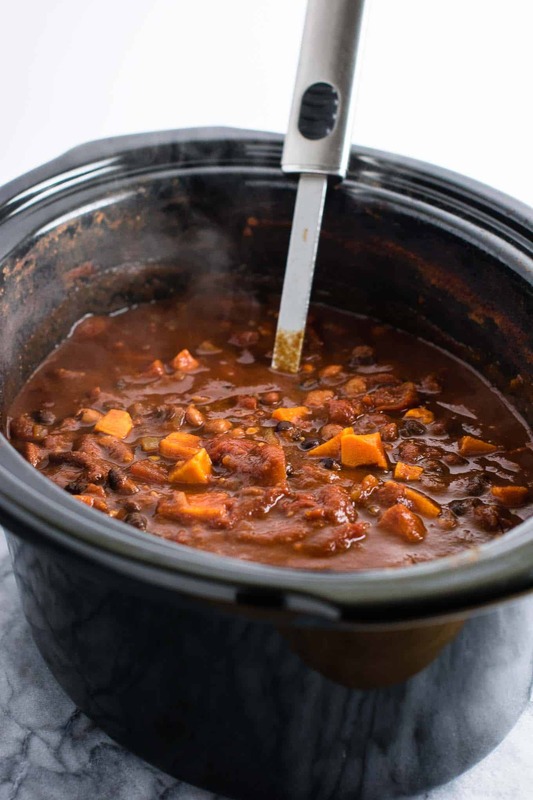 Slow Cooker Vegetarian Sweet Potato Chili Recipe - 10 minutes to prep! Good old comfort food for lazy nights. 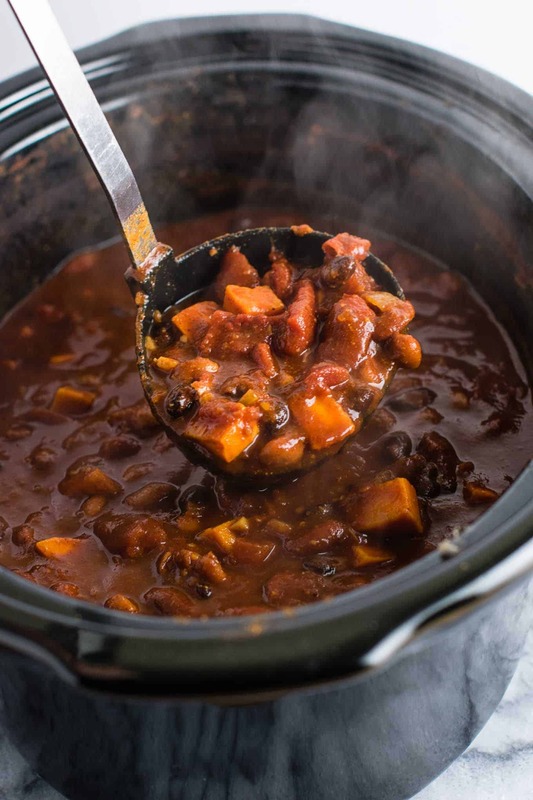 This particular chili recipe is prepped in just 10 minutes, and cooks all by itself the rest of the time. Now that’s my kind of easy dinner! 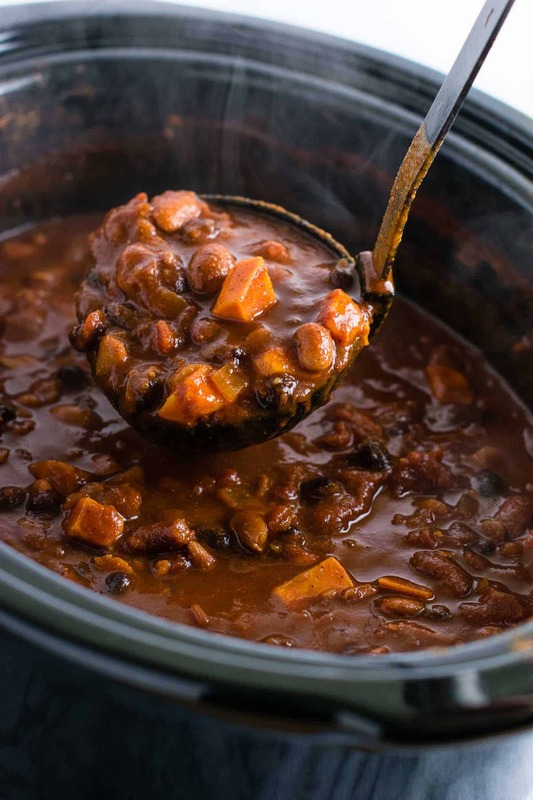 I based this recipe off of my Slow Cooker Vegetarian Chili Mac, which was a big hit with you guys. 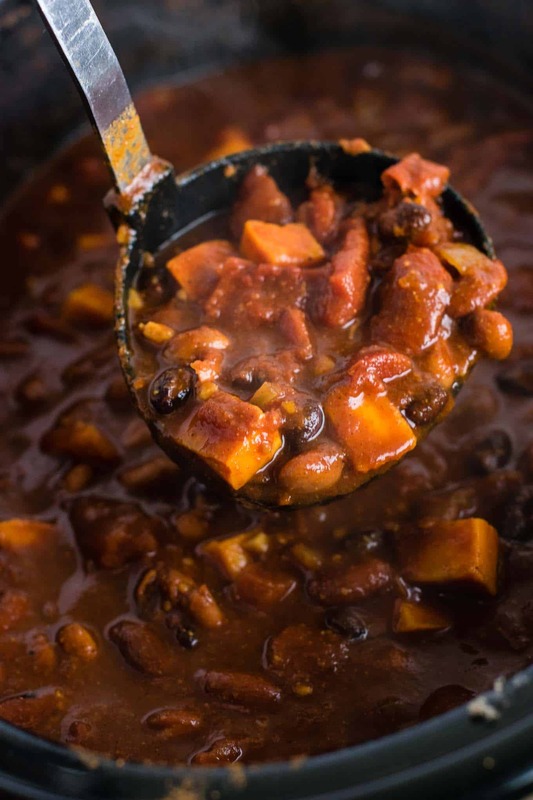 I threw in some sweet potatoes for added veggies and swapped out some kidney beans for black beans. 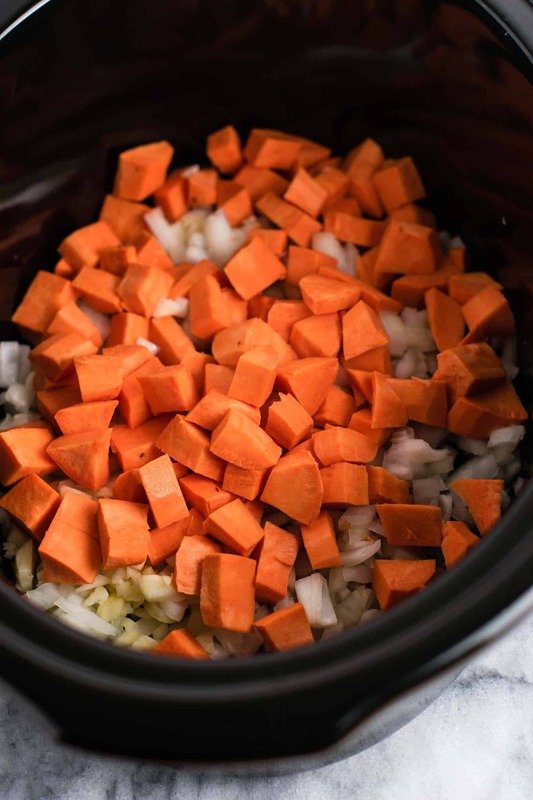 Start off with a base of fresh garlic, onion, and sweet potatoes. In this recipe, I don’t saute the garlic or onion first, like I normally would. Instead, I put them in raw, and adjusted the cook time accordingly. It took a little longer to cook, but was less work for me so I loved it! 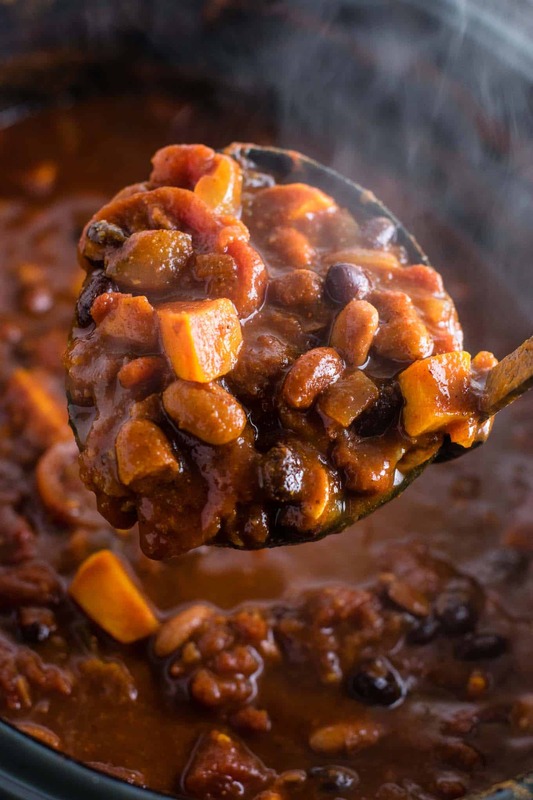 Next up: all the classic chili favorites: stewed tomatoes, diced tomatoes, chili beans, kidney beans, and black beans. Add some veggie broth and spices and it’s DONE. I cooked mine on high for right around 5 1/2 hours and it was perfect. To check for doneness, just taste to see if the sweet potato is soft enough and the onion is no longer crunchy. 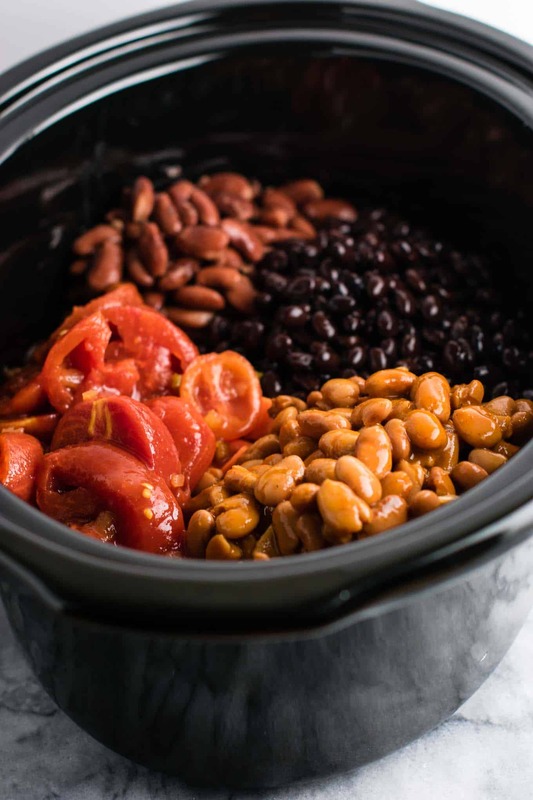 5.5 hours seemed to be the sweet spot for my slow cooker, so I suggest cooking it at least 5 – 6 hours until the texture good for you. We like to top ours with sour cream, mexican cheese, fresh lime, and cilantro. We also buy healthy brand frito-like chips and they are heavenly paired with chili! 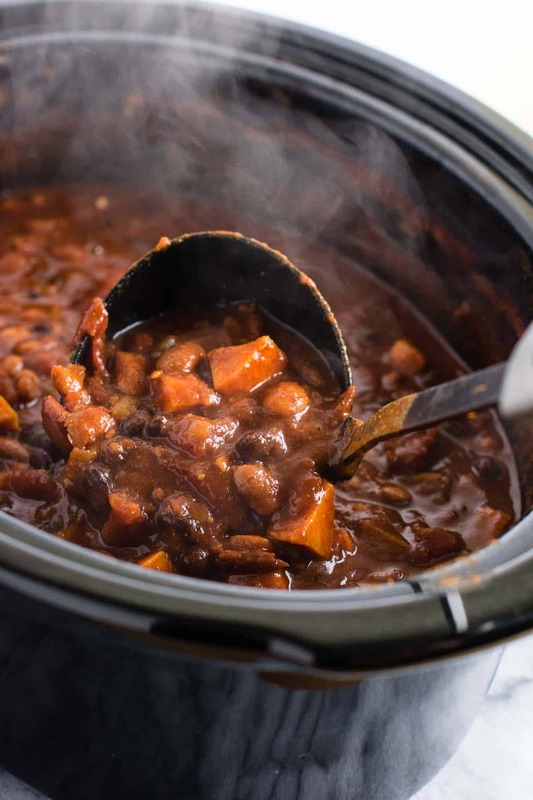 I love crockpot dinners in the winter especially, and this slow cooker vegetarian sweet potato chili makes a huge batch. Since it’s just my husband and I eating it, we usually will eat it twice and freeze the rest. 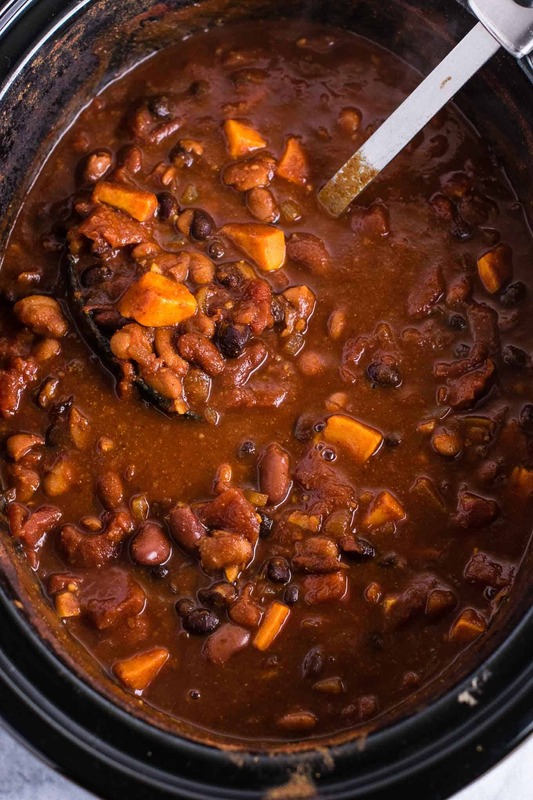 This would be a great freezer meal to have on hand! I would suggest letting it cool overnight in containers in the fridge. Then if you don’t eat it all, fill up gallon sized ziploc bags and press any air out before sealing. Put the bags in the freezer for an easy meal. 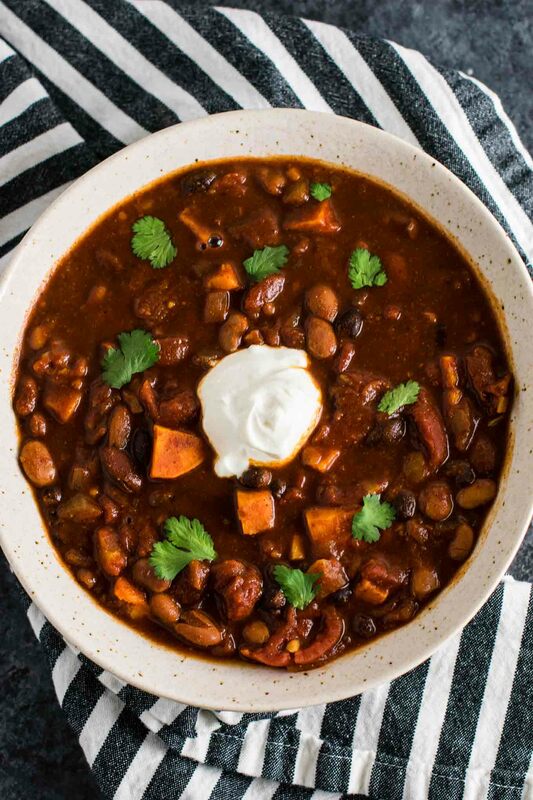 We froze chili as one of our freezer meals before my son was born, and it was so convenient and delicious! Just thaw the bag in the fridge overnight, then heat up for dinner. 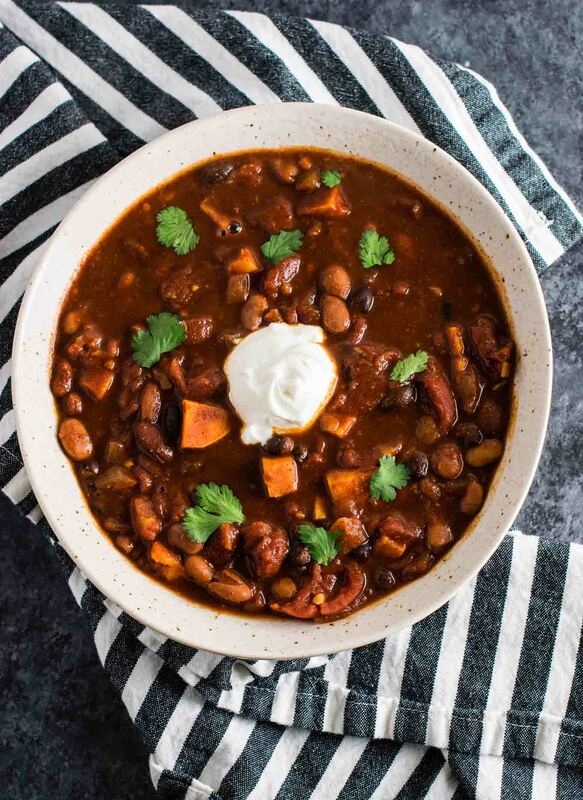 This chili is so filling and hearty, you won’t even miss the meat. It’s packed full of so much protein that I was full for hours. Are you making this recipe? I want to see! Don’t forget to tag me on instagram @buildyourbite. You can also follow me on pinterest for more delicious recipes! Hi is this recipe spicy? It has a little heat, but I wouldn’t call it spicy! You can cut down on the paprika if you are concerned.